The document upload dialog we rolled out in January allowed users to upload multiple documents at once and incorporated some nice touches like a progress bar that tracked progress of your documents. The Flash uploader was a great move forward for us but a handful of our users were having trouble with it, so we’ve rewritten it in open-standards based HTML5. Notice anything different? You shouldn’t: even though the code running file uploading is very, very different, you shouldn’t see anything change. Behind the scenes, however, we are now using open-standards based HTML5 technology to handle multiple files. Before we were using a Flash-based uploader, which would cause issues on computers using an older version of Flash, as well as with certain edge-cases that could not easily be resolved. 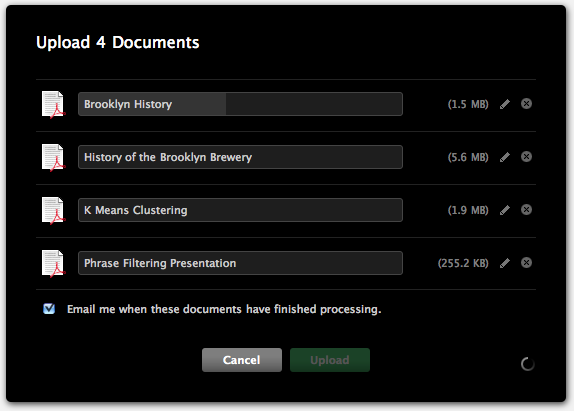 This move, should give all DocumentCloud users a smoother experience when uploading files. Because this file uploader is running on an open-standard, the file dialog to feel more like the file selector you’re used to. Internet Explorer users will find that they can only upload one file at a time, because that browser doesn’t yet support HTML5. Internet Explorer 9, scheduled for release later this year, may not support multi-file uploading, but if it does, we will update the uploader to support it. If you encounter any issues or notice anything going wrong, please don’t hesitate to contact support@documentcloud.org and let us know. We want to make sure file uploads work flawlessly for everybody. Any plans to open source the code? This would be awesome to have. Haven’t found much in the way of OSS HTML5 uploaders. You guys are always doing something awesome. We’re just using an open-source library for multi-file uploading: https://github.com/blueimp/jQuery-File-Upload. Nothing too special, although we rewrote the UI to match our interface, which includes the progress bars, some smoothing of how progress is shown, and the dialog you see above. Before, we were using Uploadify, which handles multi-file uploading through Flash. The entire workspace will be open-sourced relatively soon, so if you want to see how everything is glued together, pay attention to this blog over the next few weeks. Tomm, good point. I’ve corrected the post. Unfortunately, there really is no word on whether or not IE9 will support multi-file uploading. Chances are it won’t, which means this uploader will continue to only support a single file at a time in IE’s latest and greatest. To follow-up, IE9 does not support multi-file uploading, and will continue to work like previous versions of IE — one file at a time, with no progress bar.